Help your children to make healthy choices with our pack of teaching resources. Includes a topic guide to discuss with your class, a range of activity resources and display materials to enhance the learning environment. One 10 Page Healthy Living Guide – A PDF / Powerpoint guide to healthy lifestyles and healthy choices. Includes information about diet, exercise, keeping clean, sleep, medicines and staying safe. Three ‘Healthy or Not?’ Activities – Can your children sort these activities into ‘healthy’ or ‘not healthy’ groups? These resources are available at three different levels of difficulty and are a great starting point for discussions about healthy choices. Six ‘A Healthy and an Unhealthy Day’ Timelines – Can your children create imaginary timelines of a healthy and an unhealthy day? What activities / meals will they draw or write about? Five Healthy Living Charts – Five charts that children can use to record a range of healthy habits and activities. How much exercise do they complete every day? How many portions of fruit and vegetables have they eaten? Have they brushed their teeth? Did they walk to school? Have they washed their hands before eating? Seventy-Two Food and Drink Cards – A set of cards that show different items of food and drink. Use them to discuss which foods are healthy / unhealthy, use for sorting activities or to plan your own healthy recipes! Seven Food Sorting Posters – Challenge your children to identify different foods that can be sorted into the groups on these posters. They can record their answers by drawing or writing… or use the Food and Drink Mini Cards in this pack. Twenty-Four Food and Drink Nutrition Cards – A set of cards that show the nutritional information for different types of food and drink. Use them for sorting, grouping, ordering, comparisons and many other Science and Maths activities. The data is also available in a downloadable Excel spreadsheet. Six Food Container Templates – Printable plates, boxes, bowls, trays and baskets that your children can use to design their own healthy (or unhealthy) meals. Three Banners – A set of ‘healthy living’ banners to use on the display boards in your classroom. 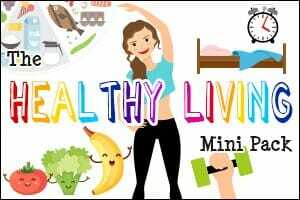 Watch the video below to view samples of resources from the Healthy Living Mini Pack. I went through this pack with my 4 year old as they have just decided they only want to eat junk food now! The pack was well written and easy for my 4 year old to understand. The activities prompted further discussion and my small person understands the importance of healthy living and exercise a lot more now. Super mini pack. This resource has provided a number of resources, ready made, to use with my class to help them understand a balanced diet. I particularly like the cards with nutritional information to help children make healthy choices, but to also see that they can enjoy chocolate in moderation! My son has complex disabilities and some things are not easily adaptable for him, but this pack was brilliantly easy to use. He particularly liked the charts and they helped him to focus on physical activity, which is not easy when you can't do a lot of physical things. I have been using Teaching Packs for many years and they are always colourful, informative and easy to adapt to different age levels. The Healthy Living pack is no different! Great work yet again. - I'm already looking forward to the Myths and Legends Pack !! Love all your packs. Fabulous work. I really appreciate all the packs that you have designed. I've used most of them and find them really beneficial. Thank you for the great efforts you're doing! Keep it up! Exactly what I was looking for! I needed a health unit and you came through for me without me even asking! Love your units!!! Thank you for this newest and informative pack! My year 3 children are about to start a series of lessons about nutrition as part of our science topic. There are so many resources that I will be able to use within these lessons. Helping children understand about nutrition and healthy living NOW is an essential in understanding how they can then be healthy adults in the future! Well done! Thanks a lot for this very useful pack to introduce food and health. My French pupils love talking about food!